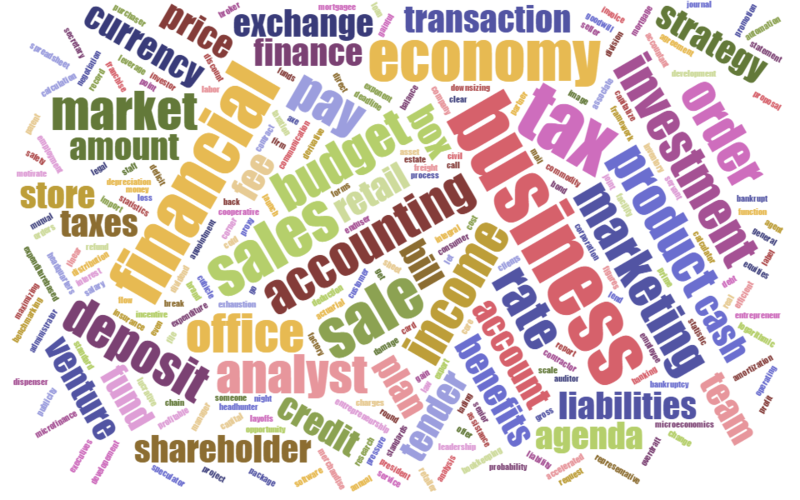 Download the PDF of the business vocabulary cards above and print double sided copies from page 2 onward. In groups of three or four, place the pack of cards on the table in the middle with the cards face down. Player one picks up a card and reads the French clue. The other players try to guess the English word. The first player to guess correctly gets the card. Play continues to the left (clockwise). The person with the most cards after twenty minutes of play is the winner. A register of financial transactions for securely and quickly providing frequent access to funds on demand, through a variety of different channels. A person concerned with the maintenance and audit of business accounts and the preparation of consultant reports in tax and finance. A detailed report of the financial state or transactions of a person or entity. One who administers, especially one who works as a manager in a business, government agency, or school. A negotiated and usually legally enforceable understanding between two or more parties. The process of decreasing an amount over a period. When used in the context of a loan, amortization is the process by which your loan principal decreases over the life of your loan. A quantity of something, typically the total of a thing or things in number, size, value, or extent. A document reporting to stockholders on management and operations and containing fiscal information, published yearly by a publicly held corporation as required by federal law. An agreement to meet with someone at a particular time. Anything tangible or intangible that is capable of being owned or controlled to produce value and that is held to have positive economic value. A person united with another or others in an act, enterprise, or business; a partner or colleague. The business carried on by a bank or a banker. Declared in law unable to pay outstanding debts. Comparing one’s products to those of competitors in order to improve quality and performance. A payment made or an entitlement available in accordance with a wage agreement, an insurance policy, or a public assistance program. A document issued by a carrier to a shipper, listing and acknowledging receipt of goods for transport and specifying terms of delivery. A category of products that are all made by a particular company and all have a particular name. The point in a business venture when the profits are equal to the costs. The individual who looks closely at a company or department’s operations to find where the areas of weaknesses are, and helps develop solutions to overcome those weaknesses. A small card printed or engraved with a person’s name and business affiliation, including such information as title, address, and telephone number. Set of documents prepared by a firm’s management to summarize its operational and financial objectives for the near future (usually one to three years) and to show how they will be achieved. It serves as a blueprint to guide the firm’s policies and strategies, and is continually modified as conditions change and new opportunities and/or threats emerge. When prepared for external audience (lenders, prospective investors) it details the past, present, and forecasted performance of the firm. And usually also contains pro-forma balance sheet, income statement, and cash flow statement, to illustrate how the financing being sought will affect the firm’s financial position. To use as or convert into capital. Automatic machine from which a bank customer can withdraw money. The amount of money the company has on hand to pay of its operating expenses. Two or more shops or outlets that have the same owner and sell similar lines of merchandise. The sharing of meaningful information between two or more people with the goal of the receiver understanding the sender’s intended message. In business, the effectiveness of a company’s internal and external communication process is often very important to its overall success. A business organization that makes, buys, or sells goods or provides services in exchange for money. An organization or country that is engaged in commercial or economic competition with others. A formal agreement between two or more parties. A document that states the terms of such an agreement. The branch of law treating of contracts. A person who is hired to perform work or to provide goods at a certain price or within a certain time. The basic or most important part. A corner office is an office that is located in the corner of a building. An association of individuals, created by law or under authority of law, having a continuous existence independent of the existences of its members, and powers and liabilities distinct from those of its members. See also municipal corporation, public corporation. To estimate the price of making a product. An account which a customer has with a shop which allows him or her to buy goods and pay for them late. A small partitioned-off area of a room, for example one containing a bed in a dwelling or one containing a desk in an office. Someone who buys goods or services from a business. injury or harm that reduces value or usefulness. A time limit, as for payment of a debt or completion of an assignment. Fixed amount or percentage permitted by taxation authorities that a tax payer can subtract from his or her adjusted gross income to arrive at the taxable income. The amount by which something, esp. a sum of money, is too small. The derivative of a function of a real variable measures the sensitivity to change of a quantity which is determined by another quantity. It is a fundamental tool of calculus. Entering a foreign market by setting up assembly or manufacturing facilities in that country. To purchase or sell (a bill, note, or other commercial paper) at a reduction equal to the amount of interest that will accumulate before it matures. The delivering of products to end-users, inc. advertising, storing etc. A portion of a company’s earnings which is paid to the shareholders/stockholders on a quarterly or annual basis. The action of separating something into parts, or the process of being separated. Good faith deposit made by a buyer to underline his or hercommitment to complete the deal. An important word suggesting that you lay off staff. A person who works for another in return for financial or other compensation. The person, customer etc who is the ultimate (and so real) user of a product. The capacity and willingness to develop, organize and manage a business venture along with any of its risks in order to make a profit. The most obvious example of entrepreneurship is the starting of new businesses. In economics, entrepreneurship combined with land, labor, natural resources and capital can produce profit. Entrepreneurial spirit is characterized by innovation and risk-taking, and is an essential part of a nation’s ability to succeed in an ever changing and increasingly competitive global marketplace. Stocks and shares which represent a portion of the capital of a company. The state of being extremely tired. Budget based on the cost of goods and services already received and paid for. Financial plan based on the cost of goods and services already received and paid for. See also cost based budget. Something created to serve a particular function. A building or group of buildings containing a plant assembly for the manufacture of goods. A charge or payment for professional services. The price one pays as remuneration for services. Fees usually allow for overhead, wages, costs, and markup. A folder or box for holding loose papers that are typically arranged in a particular order for easy reference. The management of large amounts of money, esp. by governments or large companies. A field of accounting that treats money as a means of measuring economic performance instead of as a factor of production. An analyst who studies the financial performance of corporations. Someone whose job is to study companies’ financial performance, usually inorder to decide which ones to invest in. Assistance given by a company for the purchase of its shares or those of its holding companies. A business organization, such as a corporation, limited liability company or partnership. Association between a manufacturer or wholesaler (franchiser) and an independent business person (franchisee) who buys the right to own and operate a unit in the franchise system. goods transported by truck, train, ship, or aircraft. An increase, or the act of becoming larger or an increase in profit, price, or value. where double entry bookkeeping entries are recorded by debiting one or more accounts and crediting another one or more accounts with the same total amount. The total amount debited and the total amount credited should always be equal, thereby ensuring the accounting equation is maintained. An intangible, salable asset arising from the reputation of a business and its relations with its customers, distinct from the value of its stock and other tangible assets. A person who identifies and approaches suitable candidates employed elsewhere to fill business positions. A center of operations or administration. The concept or perception of a firm or product held by the general public. A tax levied on incomes, especially an annual government tax on personal incomes. Tax levied by a government directly on income, esp. an annual tax on personal income. A detailed, itemized list, report, or record of things in one’s possession, especially a periodic survey of all goods and materials in stock. Money committed or property acquired for future income. Two main classes of investment are (1) Fixed income investment such as bonds, fixed deposits, preference shares, and (2) Variable income investment such as business ownership (equities), or property ownership. In economics, investment means creation of capital or goods capable of producing other goods or services. Expenditure on education and health is recognized as an investment in human capital, and research and development in intellectual capital. Return on investment (ROI) is a key measure of an organization’s performance. A supply of capital belonging to numerous investors that is used to collectively purchase securities while each investor retains ownership and control of his or her own shares. A way of entering a foreign market by joining with a foreign company to manufacture or market a product or service. Small piece of paper, metal etc on a product giving information about it. International labor standards refer to conventions agreed upon by international actors, resulting from a series of value judgments, set forth to protect basic worker rights, enhance workers’ job security, and improve their terms of employment on a global scale. To introduce a new product, with publicity etc. The downsizing means that some people may lose their job. The individuals who are the leaders in an organization, regarded collectively. The activity of leading a group of people or an organization or the ability to do this. Leadership involves: establishing a clear vision, sharing that vision with others so that they will follow willingly, providing the information, knowledge and methods to realize that vision, and coordinating and balancing the conflicting interests of all members and stakeholders. leader steps up in times of crisis, and is able to think and act creatively in difficult situations. Unlike management, leadership cannot be taught, although it may be learned and enhanced through coaching or mentoring. Someone with great leadership skills today is Bill Gates who, despite early failures, with continued passion and innovation has driven Microsoft and the software industry to success. The act of inspiring subordinates to perform and engage in achieving a goal. Currency that cannot legally be refused as payment. To grant the use of (something) on condition that it or itsequivalent will be returned. To fire someone or lay someone off. The ratio of a company’s loan capital (debt) to the value of its common stock (equity). The financial obligations entered in the balance sheet of a business enterprise. The debts and obligations of a company or an individual. A current obligation of an entity arising from past transactions or events. In mathematics, the term linear function refers to two different, although related, notions: ⁕In calculus and related areas, a linear function is a polynomial function of degree zero or one, or is the zero polynomial. ⁕In linear algebra and functional analysis, a linear function is a linear map. A sum of money lent with interest. of, relating to, or expressed in terms of logarithms. Excess of expenditure over income or excess of cost over the net proceeds from a transaction. Profitable; moneymaking; remunerative: a lucrative business. The selling of goods by post. The members of the executive or administration of an organization or business. Someone who is in charge of a business, department, etc. An area where a product or service can be sold. Study of consumers’ needs & preferences, often for a particular product. is the process of communicating the value of a product or service to customers, for the purpose of selling that product or service. To increase or make as great as possible. A gathering of people for a particular purpose (such as to talk about business). A written statement of the matters which will be considered at a particular meeting. The branch of economics that analyzes the market behavior of individual consumers and firms in an attempt to understand the decision-making process of firms and households. A medium of exchange that functions as legal tender. The official currency, in the form of banknotes, coins, etc, issued by a goverment or other authority. Agreement by which a bank or building society lends money for the purchase of property, such as a house or apartment. The property is the security for the loan. An entity that lends money to a borrower for the purpose of purchasing a piece of real property. provide (someone) with a motive for doing something. Savings fund that uses cash from a pool of savers to buy securities such as stock, bonds or real estate. The act or process of negotiating. A place where you can put money in the bank during off hours. To provide or make accessible. A detailed projection of all estimated income and expensesbased on forecasted sales revenue during a given period. A favorable or advantageous circumstance or combination of circumstances. A group of persons organized for a particular purpose; an association. A government authority or licence conferring a right or title for a set period, esp. the sole right to exclude others from making, using, or selling an invention. To transfer or give a certain amount of money in return for a purchase. To settle (a debt, obligation, etc. ), as by transferring money or goods, or by doing something. The action or process of paying someone or something, or of being paid. The place where a product is actually sold to the public. ( often initial capital letter ) the highest executive officer of a modern republic, as the Chief Executive of the United States. The burden of mental or physical distress especially from grief, illness, or adversity. Evaluation of bid prices through (1) comparison of submitted bids or quotations, (2) comparison of current quotations with previous quotations for the same or similar items, (3) comparison with own cost estimates, and (4) use of standard measures. Something made to be sold; merchandise. The process of creating a new product or improving an existing one. The act of producing; creation; manufacture. Excess of revenues over outlays and expenses in a business enterprise over a given period of time, usually a year. Yielding profit; advantageous or lucrative. To further or encourage the progress or existence of. To raise to a higher rank, status, degree, etc. The authority to represent someone else, esp. in voting. Something that attracts the attention of the public. To get (something) by paying money for it. A commercial document used to request someone to supply something in return for payment and providing specifications and quantities. A selection of products sold by a company. Momentum and rate of change are simple technical analysis indicators showing the difference between today’s closing price and the close N days ago. A compulsory financial contribution imposed by a government to raise revenue, levied on the income or property of persons or organizations, on the production costs or sales prices of goods and services. To give back, especially money; return or repay. A person or thing that represents another or others. A person who represents and tries to sell the products or services of a firm. To express a desire for, esp politely; ask for or demand. defines the sale of goods to ultimate consumers, usually in small quantities. Alter (a number) to one less exact but more convenient for calculations. A box you can rent in the vault of a bank to protect your valuables. A fixed regular payment made by an employer, often monthly, for professional or office work as opposed to manual work. The exchange of goods, property, or services for an agreed sum of money or credit. A person employed by an individual or in an office to assist with correspondence, keep records, make appointments, and carry out similar tasks. A long standing and top ranking member of the management of an organization. In the business world, a typical senior executive is well respected within their company and has either been well educated in business matters or has worked their way up through the ranks of their company to gain an extensive range of experience. An organized system of labour and material aids used to supply the needs of the public: telephone service, bus service. The capital of a company is divided into shares which entitle the owner, or shareholder, to a proportion of the profits. A part or portion of a larger amount that is divided among a number of people, or to which a number of people contribute. written programs or procedures or rules and associated documentation pertaining to the operation of a computer system and that are stored in read/write memory. Someone who buys and sells stocks and shares in the hope of making a profit through changes in their value. A computer program in which figures arranged in the rows and columns of a grid can be manipulated and used in calculations. An average level of development or achievement. An abstract of a commercial or financial account showing an amount due. A number that represents a piece of information (such as information about how often something is done, how common something is, etc.). The practice or science of collecting and analyzing numerical data in large quantities, esp. for the purpose of inferring proportions in a whole from those in a representative sample. A building or room where things are sold. An agreement to purchase a certain amount ofsecurities, such as stocks. The process or skill of taking one number or amount away from another. A person who manages or superintends an organization or activity. Someone who offers goods and services for sale. The amount of a resource that is available. The management of accounting practices that incorporates tax laws. This type of accounting is regulated by the IRS. A legal system for assessing and collecting taxes. legal system – a system for interpreting and enforcing the laws. law, jurisprudence. A group of people organized to work together. Non-traditional, innovative work environment relying on teams to achieve its objectives. TBO’s major characteristics include (1) mutual trust, (2) employee empowerment in planning, organization, and goal-setting, (3) shared responsibility for self-management, (4) shared accountability for performance, and (5) shared leadership. An employee of a bank who receives or pays out money at a counter. Something tendered or offered, especially money, as in payment. To strive against another or others to attain a goal. A person undergoing training for a particular job or profession. Something that is transacted, esp a business deal or negotiation. One who has charge of funds or revenues, especially the chief financial officer of a government, corporation, or association. A person or organization that finances something. Newer (and usually more expensive) version of a computer hardware or software, or machine or equipment. A risky or daring journey or undertaking. The internet version of word-of-mouth marketing – email messages that customers pass on to friends. A list of passengers or goods being carried on a vehicle. The sale of goods in large quantities, as for resale by a retailer. Take money from a bank account. The action of withdrawing something. A year during which plan records are kept. This can be a fiscal or calendar year. Use these glossary items with the Virtual Writing Tutor’s Target Structure vocabulary checker. Download the PDF of the business vocabulary cards above. Print double-sided copies from page 2 onward.